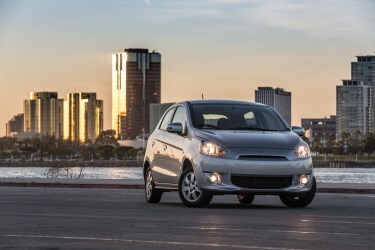 The 2015 Mitsubishi Mirage is a strange and very compact thing. It has a slightly sporty appearance—and we do emphasize “slightly”—that can be converted into quirky or stylish with bold paint choices like Kiwi Green and Plasma Purple. Everything about the Mirage comes down to weight saving, which we would posit as success as it weighs only about 2,000 pounds. It may not look like much but it more than makes up for it in fuel economy. Again, weight saving. The 2015 Mitsubishi Mirage offers a tiny 1.2-liter three-cylinder engine mated to a five-speed manual, or to a wide-ratio continuously variable automatic transmission for better mileage. It produces 74 horsepower and 74 pound-feet of torque. There’s no engineering magic here: it’s not very powerful. Efficiency is the reason behind the 2015 Mitsubishi Mirage and it’s fair to say it pulls it off extremely well. With the standard manual transmission, it’ll get 34 mpg in the city and 42 mpg on the highway. With the automatic, those numbers go up to 37 mpg city and 44 mpg highway. This kind of efficiency is on par with hybrids and rarely seen in purely gas-powered vehicles. Despite the emphasis on weight-saving, the 2015 Mitsubishi Mirage does make some exceptions in the interior. There’s space for at least two adults in the back and the seats are comfortable enough to support everyone for medium-length trips. It also comes standard with automatic climate control when most cars at this price point do not and even offers a rearview camera, though the Mirage’s small size makes it unlikely you’ll need it. The 2015 Mitsubishi Mirage comes standard with antilock brakes, stability and traction control, front and rear head airbags, dual front side-mounted airbags, emergency braking assist, and tire pressure monitoring system.